For a man to be the whole of his life hopelessly engaged in performing one repulsive and never-ending task, is an arrangement fit enough for the hell imagined by theologians, but scarcely fit for any other form of society. Most men would be insulted, if it were proposed to employ them in throwing stones over a wall, and then in throwing them back, merely that they might earn their wages. But many are no more worthily employed now. Letter to Lucy Brown (Sept. 8, 1841): "I, who am going to be a pencil-maker tomorrow, can sympathize with God Apollo, who served King Admetus for a while on earth." Journal (Aug. 6, 1851): "Ah, yes, even here in Concord horizon Apollo is at work for King Admetus! Who is King Admetus? It is Business, with his four prime ministers Trade and Commerce and Manufactures and Agriculture. And this is what makes mythology true and interesting to us." Journal (Sept. 21, 1851): "As I go through the fields, endeavoring to recover my tone and sanity and to perceive things truly and simply again, after having been perambulating the bounds of the town all week, and dealing with the most commonplace and worldly-minded men, and emphatically trivial things, I feel as I had committed suicide in a sense. I am again forcibly struck with the truth of the fable of Apollo serving King Admetus, its universal applicability. A fatal coarseness is the result of mixing in the trivial affairs of men. Though I have been associating even with the select men of this and the surrounding towns, I feel inexpressibly begrimed. My Pegasus has lost his wings; he has turned a reptile and gone on his belly. Such things are compatible only with a cheap and superficial life." Journal (April 4, 1854): "I am thinking what an elysian day it is, and how I seem always to be keeping the flocks of Admetus such days  that is my luck." 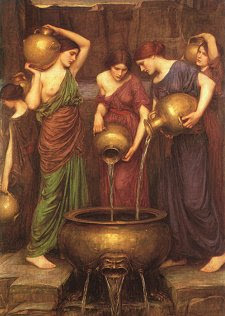 Other Greek myths illustrate the futility of work. I can think of three  the punishments suffered by Sisyphus, the Danaides (daughters of Danaus), and Ocnus in Hades. 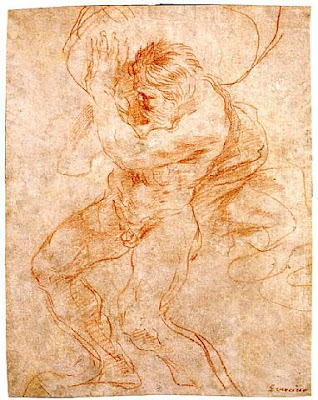 Yea and I beheld Sisyphus in strong torment, grasping a monstrous stone with both his hands. He was pressing thereat with hands and feet, and trying to roll the stone upward toward the brow of the hill. But oft as he was about to hurl it over the top, the weight would drive him back, so once again to the plain rolled the stone, the shameless thing. And he once more kept heaving and straining, and the sweat the while was pouring down his limbs, and the dust rose upwards from his head. Some ingenious person, probably a Sicilian or an Italian, playing with the word, invented a tale in which he called the soulbecause of its believing and make-believe naturea vessel, and the ignorant he called the uninitiated or leaky, and the place in the souls of the uninitiated in which the desires are seated, being the intemperate and incontinent part, he compared to a vessel full of holes, because it can never be satisfied. He is not of your way of thinking, Callicles, for he declares, that of all the souls in Hades, meaning the invisible world (aeides), these uninitiated or leaky persons are the most miserable, and that they pour water into a vessel which is full of holes out of a colander which is similarly perforated. To whom begins again his labour's end. Bibliography on the Danaides includes Campbell Bonner, "A Study of the Danaid Myth," Harvard Studies in Classical Philology 13 (1902) 129-173, Eva Keuls, Water Carriers in Hades: A Study of Catharsis Through Toil in Classical Antiquity (Amsterdam: A.M. Hakkert, 1974), and William Hansen, Ariadne's Thread: A Guide to International Tales Found in Classical Literature (Ithaca: Cornell University Press, 2002), pp. 69-75 = "Carrying Water in a Sieve." I have not read any of these. Behind them is sitting a man who the inscription says is Oknos. He has been painted plaiting a rope, and a she-donkey stands beside him eating the rope as he plaits it. They say this Oknos was an industrious man with an extravagant wife; however much he earned working, she soon spent it. For more on Ocnus see Friedhelm Hoffmann, Seilflechter in der Unterwelt, Zeitschrift für Papyrologie und Epigraphik 100 (1994) 339-346.